I still remember getting a tricycle for Christmas when I was 3 years old. When I was bit older, I got a “Peaches and Cream” bike with a big banana seat and handlebar tassels. I used to ride around the cul-de-sac with my friends, sometimes pretending our bikes were cars going through an imaginary drive thru and obeying pretend traffic lights. Eventually I graduated to an adult-sized hybrid bike in junior high and rode it around the neighborhood. Sometimes my friends and I would ride our bikes to a convenience store about 2 miles away so we could buy candy. I started riding in a more focused way when I trained for a triathlon. After the triathlon I realized I really enjoyed the cycling aspect of that event and I started training for long-distance rides for charity. As of 2013, I have completed in five MS150 charity rides (that’s 150 miles in 2 days). I’m proud to have completed my first century last year. The only event I’ve competed in was a sprint triathlon. I prefer non-competitive events like charity rides or long rides with friends. What would be your most favorite charity ride? 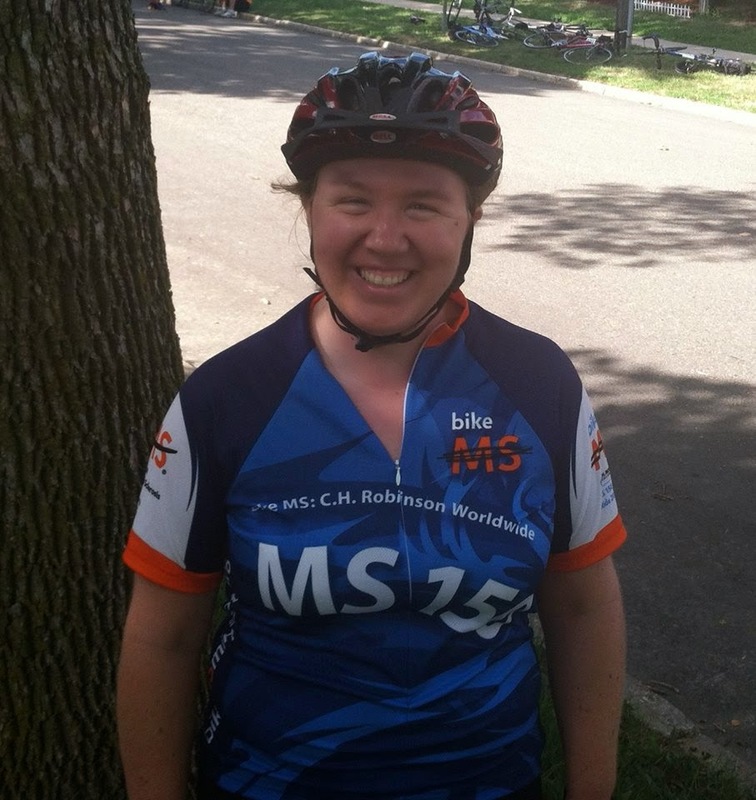 My favorite charity ride is the Minnesota MS150, where you raise money for Multiple Sclerosis research. What inspired you to choose long-distance/charity rides? My dad has been doing the MS150 since the 1990s. A group of his friends had a mutual friend with MS and started a team. I joined my dad for the first time in 2009 and it was a very uplifting experience. I like the challenge of doing those kinds of long-distance rides, and raising money for charity is a great motivation too. I prefer road biking on paved roads and trails. What would be your most favorite paved/road ride experience? The MS150. I love the positive, non-competitive atmosphere of the ride. I also like the feeling of being supported on a ride with food stations and sag wagons in case something goes wrong. I also enjoy riding and chatting with my dad on long rides like the MS150. Yes. I got clipless pedals a few years ago and they are great. I think they have definitely helped me in my pedaling efficiency. To all you beginners out there I would say: you may fall once or twice when you first get clipless pedals, but after a while you get used to them and it is like second nature clipping in and out. I haven’t fallen for two seasons now (knock on wood!). I’ve only fallen a couple times when I was first getting used to my clipless pedals, and the most I got was a skinned knee. Otherwise I’ve been really fortunate. I love to soar down hills. It makes me feel like I am flying. Training is really important. There are lots of great training plans out on the web-- the trouble is sticking to it! But if you do, you will feel so much better during the actual event. A good bike fitting makes riding long-distance so much more comfortable as well. A professional bike fitting can be expensive, but I think it worth it. I did my first century last year, and my struggle during that ride was staying properly hydrated and consuming enough calories. Dehydration can really sneak up on you. You think you are doing fine, and then it hits you. That's something I'm going to try to work on this year.